Dwarf trees may be the answer to your small-space problem. These trees offer many of the same attributes as their larger cousins, but in a space-saving package. There are many different types of smaller trees that can enhance your landscape. There is a size difference in dwarf trees compared to standard-sized trees. They are usually under 10 feet tall, whereas their standard counterparts can reach heights of 20 to 40 feet tall. They are smaller and therefore easier to prune and care for during their lifespan. They make it easier for gardeners to harvest fruit. They take up a smaller area in the garden or lawn, making them perfect in areas where space is at a premium. Dwarf trees are high maintenance and require more one-on-one attention and irrigation. They may need to be staked. Because they are difficult to propagate, they may cost more than other trees. Their size is influenced by many factors, like rootstock, so if you plant more than one, all the rootstocks must be the same to keep the sizes consistent. Some dwarf varieties may have a shorter lifespan than standard trees. In order to maintain their size, pruning is recommended in the spring each year. This will help your tree maintain its proportions and ensure lots of beautiful fruit in the summer. Nothing adds curb appeal like a beautiful ornamental tree. With so many beautiful varieties to choose from, it may be difficult to just plant one or two. It is always important to choose dwarf ornamental trees that will do well in your locale's hardiness zone. Other considerations should include whether you want a flowering tree or shade tree, and whether you mind a little lawn debris that may result. Most dwarf ornamental trees fall in the 10 foot or shorter category, but you should still give them plenty of room away from buildings and fences for optimum growth. While smaller specimen trees add interest to any landscape, it is important to not get carried away and plant too many. A lawn full of tiny trees may detract from your home instead of enhancing it. Overcrowding can also cause problems for your trees, as they will have to compete with each other for sunlight and nutrients from the soil. Semi-dwarf trees are slightly taller than their dwarf counterparts. They usually grow between 10 and 15 feet tall. These trees are also good for individuals with a small area in which to grow trees. There are many fruit and ornamental trees that fall within this category. Miniature trees are usually under four feet tall and can be grown in pots. These types of trees are perfect for people who only have a small patio space for their trees or need to bring the plants indoors for the winter. It is important to remember that many miniature trees not only need a warm house to live in, but they also need the right level of humidity and sunlight in order to thrive in the winter months. 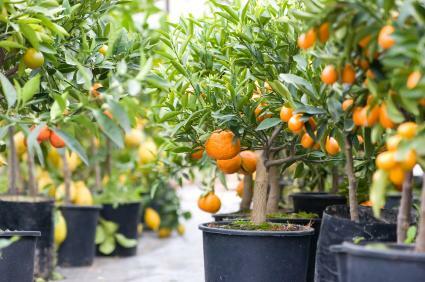 This is especially important for miniature citrus trees. Gurney's® Seed & Nursery Company: Make your selection from their wide range of dwarf fruit trees such this dwarf Meyer lemon or dwarf fig tree. You'll receive your tree at just the right time for planting in your hardiness zone. Park Seed: Park's offers several varieties of dwarf trees, such as fig or banana trees, or a continuously blooming Buddleia bush. Be sure to check their shipping policies section for complete guidelines on purchasing and shipping, as some varieties of dwarf trees cannot be shipped to certain states because of quarantine laws. Bonsai Boy of New York: If the idea of purchasing a potted, mature and ready-to-enjoy tree is more to your liking, Bonsai Boy features a flowering dwarf weeping Barbados Cherry Bonsai tree on their website. While the fruit is, unfortunately, inedible, the tree produces beautiful rose-pink blooms that are highly decorative. Henry Field's Seed & Nursery: Browse their selection of fruit trees before you make your final selection for your tree. Venous orange, pomegranate, and Citura tangerine are just a few of the many varieties you'll find here. Whether your interest in smaller sized trees is due to space constraints, a desire to enhance your landscape with ornamental trees, or you long to grow your own fresh fruits, dwarf trees can be an agreeable solution. Like most choices in life, weigh the risks versus the rewards to make the decision that is best for you. Once you have done your due diligence, then all you'll have to do is plant your trees and enjoy!